So here's a question you DON'T want your students to ask you. And this is when you DON'T appear to be very observant either. So a week ago I went out on Sunday afternoon to return a Christmas gift, and I got a gift card rather than my money returned. I had decided to buy myself a down vest if they had any that fit me and one that I liked the color. I took the gift card because I figured if they didn't have one I liked I could just hold onto the gift card until I was back at the store and they did have one I wanted. Well they had a vest that fit and the color (cream with red stitching) looked very good on me. Plus, it was marked way way down so using my gift card I actually only had to pay $12 out of my pocket for it. A pretty good deal since the original price was $159. So Monday morning it was quite cold and I figured I would wear my vest over over my sweater . I leave for work very early, just before 6:30 AM, and at that time it is still pretty dark and I am still pretty tired. I clipped off the tags and put on the vest and I was ready to leave the house. So that morning I was standing in front of my class, chatting a bit, when this boy stood up and walked towards me. "Mrs. Nelson" he started "you have something handing from the armpit of your vest." I reach under my arm and feel this plastic security tag. 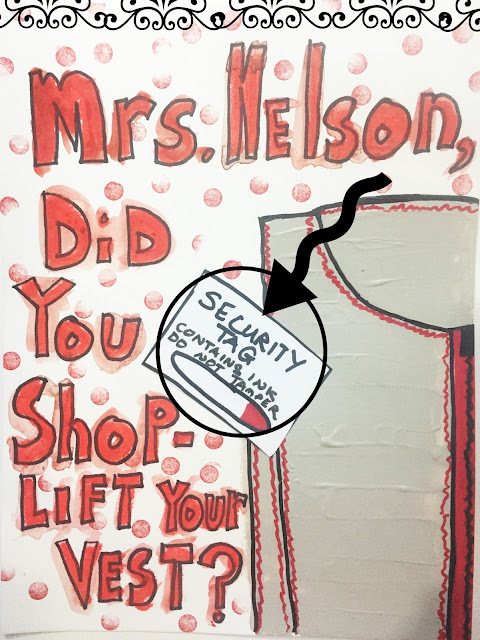 The boy looked carefully (as he was now standing next to me) and said "Mrs. Nelson, you didn't shoplift your vest did you?" Now luckily they are good kids in that class and no one believed that I would actually shop lift, because I wouldn't shoplift, ever. Instead they all gave me good advice -like don't try to take it off as its full of dye and will get all over everything. Some of them had even had the same similar experience at various stores-where the clerk had forgotten to remove the security tag. But still, it was a little embarrassing. So today for Art Journal Journey I have a page I made in my journal about this story, and since the theme this month at AJJ is stories, I thought it would share it with you. Not a very exciting page, or anything very complicated, just me drawing and painting with paint and watercolor crayons. And I little stamping to complete the page. I'v got no school today for the Martin Luther King holiday. No plans- but I've got a bunch of journal pages to finish up and a set of tests I should grade. Lets see what the day brings whether I grade those tests or not. Hope everyone had a good start of the new week. Lol!!! What a super story and I love how you brought it to paper with color! I had the same experience two times.. The first time it was an expesive dress and I drove back to the shop the next day so that they could remove this and one of this little bombs on a bikini a few years later I put away by my own without getting it inked or hurting the fabric.... I was a hero I guess! I can imagine that it was fun for the pupils!! Hihi!!! Yikes I am not even familiar with security dye packs? Funny exchange and then again not so funny huh! A very good lesson in how things are not always how they seem. My question is, did you take the vest back to the place you bought it to have the security tag removed? I think this is a great story, and totally fits in with your theme this month. I really LIKE it. I have has a huge grin with this story. Over here if the tag was still on the garment, the security scanners at the store entrance would have sent the alarms going. I hope you got it sorted and removed. Its a fantastic journal page. Great story and a mega-fun journal page to remember it by, and what nice kids you are teaching. I think maybe you are a good teacher. I've got the same question as Elizabeth, as I don't think you can take these tags off without the proper removing-tool (although real shop-lifters must know how to do it). Terrific story and I love how you conveyed it in your art!